Whether you’re an aspiring Mapplethorpe or a filmmaker in the vein of John Waters, the Flicks Film and Art Festival wants to showcase your creativity. The festival, which will be held in Broadhurst, Saturday, March 28 at 7 p.m., will feature the art and film creations of SNU students. If you want to participate in the festival, here are the important dates that you need to know. All submissions are to be turned in to Jessica Bowie, Vice President of Publicity for SGA. Art submissions are due by Thursday, March 26. Video submissions are due by Tuesday, March 24 at 10 p.m. Video submissions can be submitted either on a flash drive or by video link. Links can be sent to Jessica Bowie at jebowie@mail.snu.edu. While the guidelines for art are open ended, video submissions need to be between 3 to 10 minutes long. The best film, as chosen by the attendees of the festival, will receive $100. If you are planning on attending the festival, entry is only $2 or free with a crimson card. In addition to the art and film, Pop’s Arcadia soda will be available as well as snacks. During the film intermission, live music will be provided by Ryan and Emily Andrews. T-shirts are also available with this year’s festival logo, which was designed by Jessica Bowie, for $10. 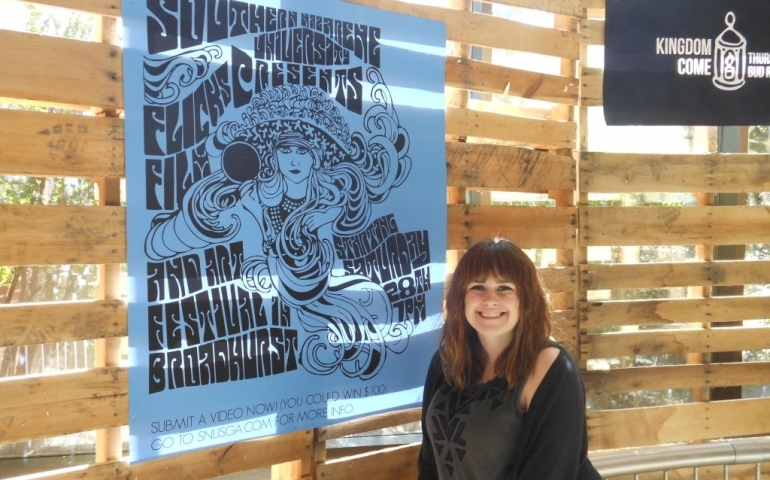 The goal of the festival, according to Bowie, is for the students and faculty to see the creative talent that we have on campus and to showcase the talent of SNU’s art community, including those majoring in graphic design. For those submitting art and film, it gives them a chance to take a risk and to put themselves “out there”. Bowie has moved the festival to Broadhurst this year to achieve a more intimate feeling for those both participating and attending. For further information you can contact Jessica Bowie at jebowie@mail.snu.edu or visit www.snusga.com/flicks.